A University of Montana research team has pinpointed new evidence that hotter, drier conditions make it hard for tree seedlings to survive after fire. This important new evidence confirms previous studies that arrived at the same conclusion, specifically that hotter, drier times leave western US conifer seedlings at risk of shriveling and dying before they can bring new forest into being after fire. The Missoulian’s recent headline, Forest to Grasslands, summed it up pretty well. A longer summary is possible — The hotter and drier conditions so favorable to fire are unfavorable to survival of seedlings after fire has come and gone. Many will have lingering questions even after the important new evidence provided by the UM team. One of these questions, likely of immediate interest, centers around seedling survival after logging — if hotter and drier conditions have killing effect on seedlings after fire, won’t those same conditions have the same effect on seedlings after logging? Then there will be questions remaining about two variables already shaping the risk of forest conversion to grasslands — heat and elevation. The effect reported by the UM team has shown up when heat levels have risen by only 1 degree Celsius above levels existing before we started burning fossil fuels. And this effect has now shown up only at lower elevations on the mountain slopes. Neither effect is likely to stop at this point. Few if any believe that the heat will stop climbing at only 1C above the era before we started burning fossil fuels. Many understand that, instead, the heat will keep on climbing, that halting it at 1.5C is extremely unlikely under prevailing sociopolitical conditions, and even doing what’s needed to stop its climb to 2C faces muscular opposition. So, wouldn’t the conditions deadly to seedlings climb higher up the mountain slopes as heat increases it own climb? Given the many lines of evidence including the recent UM analysis, what we are likely seeing now is just the start of forest conversion to grasslands that could shift farther and farther upslope as we continue with fossil fuel combustion and the heat its emissions add to an already hotter world. Boiled down, that’s a scenario where continued combustion of coal, natural gas, diesel and gasoline leads to continued and even more intense combustion of the forest, followed by conversion of forest to grassland. One thing seems certain. It would be increasingly difficult to offer logging jobs on increasingly grassy mountain slopes. Ditto for all the other employment now available thanks to forest cover, and we can’t ignore forest importance to wildlife or the health effects of more wildfire smoke. The risk of an escalating forest crisis sheds new light on energy from solar and wind. This new industry can help reduce forest loss. Opposition to these promising new jobs needs to be put aside as soon as humanly possible. Lance Olsen manages a restricted listserv on climate and related concerns. We’ve all heard the common claim that forests recover from fire, and, just as surely, that forests can recover from logging. Conservationists have stressed that point in arguing that fire is not the catastrophe some have believed, because forest comes back after fire. Logging lobbyists, meanwhile, have stressed much the same point in arguing that logging is not the catastrophe some have believed, because forests come back after logging. So, despite their well-known clashes, conservationists and the logging industry have both argued for a view that forests can indeed recover. They both have a valid point. After all, that’s what forests have done many times in the past following disturbance. That history is the basis for referring to forests as a “renewable resource.” It’s presumably the basis of recent U.S. Forest Service planning documents boasting that a forest can be managed for “resilience,” a springing back to its former self following human manipulation. Yet for much of the world’s forests, the familiar day of resilience is done. As temperatures rise, the hotter, drier air and drier soil conditions are increasingly unsuitable for young Douglas firs and ponderosa pines to take root and thrive in some of the region’s low-elevation forests, scientists write in a study published Monday in the Proceedings of the National Academy of Sciences. Wildfires in these areas could lead to abrupt ecosystem changes, from forest to non-forest, that would otherwise take decades to centuries, the study says. Davis and her colleagues looked at growth rings of nearly 3,000 young trees in 33 fire-damaged areas of California, Colorado, the Northern Rockies and the southwestern United States to see when the forests recovered after fires over the past 30 years. Analyzing climate data over the same period, they found certain thresholds involving summer humidity for ponderosa pine, surface temperature for Douglas fir, and soil moisture for both species, beyond which there was a sharp decline in forest regrowth. The warmer, drier air isn’t harming mature trees, but it is preventing future generations from growing, Davis said. “There could be a lot of areas where there is currently forest but if we have a fire we might not see regeneration,” she said. Davis and her colleagues found that most of the sites they looked at had crossed the temperature and humidity threshold at some point in the last 20 years. They targeted the driest and warmest sites in the region to see if climate change was already beginning to affect forests. The researchers now plan to assess the extent to which regeneration is affected in relatively cooler, wetter sites in the region. Several factors influence a forest’s regrowth after a wildfire, such as the severity of the fire, regional drought and how the trees produce seeds. The researchers noted that as the region sees fewer years with climate conditions suitable for seedlings to grow, the nature of the trees’ seed production, with heavy crops of cones only every few years, will further limit new growth. Last year, wildfires burned more than 8.7 million acres nationwide, 32 percent higher than the 10-year average according to an annual report by the National Interagency Coordination Center released last week. More than 1.8 million of those acres were in California, the highest in recorded state history, according to state fire officials. The inability of forests to bounce back from such fires is cause for concern, said Joe Fargione, science director for the Nature Conservancy’s North America region. Fargione said such high-risk forests can be targeted for selective thinning to reduce the risk of forest fires and for restoration efforts to improve the success of forest regeneration. Protecting forests is important for slowing climate change because of their ability to pull carbon dioxide out of the atmosphere and store the carbon in their trunks, branches and roots. A study Fargione and others published last fall found better forest, farm and land management practices offer natural climate solutions that could mitigate 21 percent of the United States’ annual greenhouse gas emissions. “It really highlights the fact that we need to begin a national and international conversation about how we can enhance the resiliency of our global forests,” Anthony Swift, director of the Natural Resources Defense Council’s Canada Project, said of the current study. Swift said intensive logging, road building and cutting trees to make room for transmission lines weakens the ability of forests to deal with added stressors like climate change. “We don’t need to stop all activity in global forests, but it does raise the need to reconsider how and where we extract timber and engage in other industrial activities in forests,” he said. A report last month by NRDC looked at how clear cutting boreal forests in Canada by some U.S. toilet paper manufacturers imperils forests and could hasten climate change.The report called for alternatives, like using recycled paper, that don’t lead to the fragmentation and clear cutting of intact forests. Leaving forests more intact could also help protect Douglas fir and ponderosa pine forests in the American West, Swift said. “Whether we are looking at wildfires or industrial activities, concerns that in a changing climate regeneration is going to be more difficult to achieve is an issue that we all need to be looking at more carefully because of the roll our forests have to play for the global climate,” he said. It’s complicated: While CO2 causes long-term warming, aerosols can have both a warming and a temporary cooling effect. The extreme wildfires sweeping across parts of North America, Europe and Siberia this year are not only wreaking local damage and sending choking smoke downwind. They are also affecting the climate itself in important ways that will long outlast their flames. Wildfires emit carbon dioxide and other greenhouse gases that will continue to warm the planet well into the future. They damage forests that would otherwise remove CO2 from the air. And they inject soot and other aerosols into the atmosphere, with complex effects on warming and cooling. To be sure, the leading cause of global warming remains overwhelmingly the burning of fossil fuels. That warming lengthens the fire season, drying and heating the forests. In turn, blazes like those scorching areas across the Northern Hemisphere this summer have a feedback effect—a vicious cycle when the results of warming produce yet more warming. How Bad Is the Climate Feedback from Fires? Although the exact quantities are difficult to calculate, scientists estimatethat wildfires emitted about 8 billion tons of CO2 per year for the past 20 years. In 2017, total global CO2 emissions reached 32.5 billion tons, according to the International Energy Agency. When they calculate total global CO2 output, scientists don’t include all wildfire emissions as net emissions, though, because some of the CO2 is offset by renewed forest growth in the burned areas. As a result, they estimate that wildfires make up 5 to 10 percent of annual global CO2 emissions each year. There have always been big wildfires, since long before humans began profoundly altering the climate by burning fossil fuels. Those historical emissions are part of the planet’s natural carbon cycle. But human activities, including firefighting practices, are resulting in bigger, more intense fires, and their emissions could become a bigger contributor to global warming. Extreme fires can release huge amounts of CO2 in a very short time. California fire experts estimate that the blazes that devastated Northern California’s wine country in October 2017 emitted as much CO2 in one week as all of California’s cars and trucks do over the course of a year. This year’s fires have also been extreme; two of the state’s largest fires on record are burning right now, including the Mendocino fire complex, which exceeded 400,000 acres this week. According to NOAA scientist Pieter Tans, head of the carbon cycle greenhouse gases group with the Greenhouse Gas Reference Network, a very large, very hot fire destroying 500,000 acres could emit the same total amount to CO2 as six large coal-fired power plants in one year. That suggests that California’s wildfires in recent years may be releasing enough CO2 to endanger the state’s progress toward meeting its greenhouse gas reduction targets. While fires have been worsening in some regions, globally the total burned area and emissions from wildfires have actually decreased over the past 20 years, said Guido van der Werf, a Dutch researcher who analyzes trends for the Global Fire Emissions Database. The global decline is because burned savannas and rainforests in the tropics are being converted to agricultural lands, which are less fire-prone. In regions of the world drying out with global warming, like the U.S. West and the Mediterranean, however, extreme fire seasons have increased in recent years. “If we start to see a higher level of fire activity than in the past because of global warming, they become part of a climate feedback loop,” van der Werf said. That means warming causes more fires, which causes more warming. In addition to their CO2 emissions, wildfires can affect the climate in other important ways. Fires don’t just burn up trees and shrubs and emit smoke. They leave behind long-lasting changes on the ground, and those changes also have effects on the climate. Over the course of several decades after a big fire, emissions from decomposing dead wood often surpass by far the direct emissions from the fire itself. But at the same time, new growth in burned areas starts to once again take CO2 from the atmosphere and store it. Fires also change the reflectivity of the land, called albedo. As burned forest areas start to regrow, lighter-colored patches of grasses and shrubs come in first, which, because they reflect more solar radiation, can have a cooling effect until the vegetation thickens and darkens again. Scott Denning, an atmospheric scientist at Colorado State University, says site-specific studies show that the cooling effect in northern forests can last for decades. In a tropical rainforest, on the other hand, the dark canopy can regrow within a few years. When new trees grow fast, they can start stashing away significant amounts of carbon quickly. But some recent research suggests that global warming is preventing forest regrowth after forest fires, including along the Front Range of Colorado and in the forests of the Sierra Nevada. If that emerges as a widespread trend in the coming decades, it means less forests available to take CO2 out of the atmosphere. Forests are estimated to absorb up to 30 percent of human greenhouse gas emissions. Scientists can’t say for certain whether the global level of fire activity in recent years is warming or cooling the atmosphere overall. Part of the reason that they don’t have a definitive answer is because, along with CO2, wildfires also produce many other volatile organic particles called aerosols, including substances like black carbon and gases that form ozone. One recent study suggests that wildfires emit three times more fine particle pollution than estimated by the Environmental Protection Agency. This pollution creates health problems, and scientists are also working to better understand its impact on the climate. Some of those aerosols can make the atmosphere more reflective. They block sunlight, which cools the atmosphere, similar to the effect attributed to emissions from volcanic eruptions. In general, the climate effect of aerosols is short-lived, lasting from a few months to a couple of years. But black carbon, an aerosol and short-lived climate pollutant, can actually absorb heat while floating around in the air, and that heats the atmosphere. Recent research shows that the heat-trapping potency—though it is short-lived—is much higher than previously thought, roughly two-thirds that of carbon dioxide, according to Alfred Wiedensohler, with the Leibniz Institute for Tropospheric Research. Megafires may intensify these emissions and send them higher into the atmosphere. A study published this week found that wildfires in Canada in 2017 resulted in extreme levels of aerosols over Europe, higher than those measured after the 1991 Mt. Pinatubo eruption. An increase in megafires, driven at least partly by global warming, could change the wildfire carbon cycle, said Mark Parrington, a senior scientist with the European Centre for Medium-Range Weather Forecasts Copernicus Atmosphere Monitoring Service. “In general, if we’re seeing an increase in megafires, with direct injections (of pollutants) into the upper atmosphere, the effects can linger for weeks or months, and that could have more of a climate-cooling effect,” he said. More pieces to the wildfire-climate puzzle will fall into place after scientists evaluate data gathered by a C-130 airplane that’s making daily cruises near Western U.S. wildfires to take detailed measurements of wildfire emissions. The mission is sponsored by the National Center for Atmospheric Research and the National Science Foundation. With the explosion of wildfires in the region the past few decades, the data will help evaluate impacts to human health and the environment, including nutrient cycling, cloud formation and global warming, said University of Wyoming atmospheric scientist Shane Michael Murphy, one of the project researchers. Eventually, the skies will clear once again, but all that smoke doesn’t just magically disappear. The CO2 will heat the atmosphere for centuries; the methane for a few decades. Some of the aerosols and other particles are heavy enough to drift earthward, and others will wash to the ground with the first good rains of autumn or winter, but not before spreading out over the Northern Hemisphere’s oceans and continents. Those tiny remnants of burned plants can also affect the climate when they land on mountain glaciers and especially on the snow and ice in the Arctic. In some years, scientists have traced soot from wildfires in Canada to Greenland, where they darken the ice and snow and speed up melting. Wildfire pollution was a significant factor in the record surface melting of the Greenland ice sheet in 2012, said climate scientist Jason Box. The overall effect of wildfire fallout on Arctic melting is difficult to quantify, partly because of sparse sampling across the remote area, and partly because of the great annual variations in wildfire emissions. But a growing body of research suggests that wildfire soot will contribute to accelerating the Arctic meltdown in the decades ahead. With wildfires burning farther north, emissions from wildfires in Greenland or Sweden could add significantly to the load of snow-darkening pollution in the Arctic because the sources are so close to the ice sheets. A 2016 study in Alaska estimated that risk of tundra fires will increase fourfold in the coming decades. Once the spark is lit, humans can’t do much to change wildfires’ greenhouse gas emissions. But it’s still important to include them in the calculations for reaching the greenhouse gas reduction targets in the Paris climate agreement. With time running out to try and cap global warming at well-below 1.5 degrees Celsius, every ton of CO2 counts, and knowing how extreme wildfire seasons affect greenhouse gas emissions lets the world know how much it will have to cut emissions elsewhere. Understanding how emissions form during wildfires could also help in the design of mitigation strategies to reduce their impact, said Christine Wiedinmyer, associate science director of the Cooperative Institute for Research In Environmental Sciences (CIRES) in Boulder, Colorado. For example, a recent CIRES research project suggests that hotter, uncontrolled fires produce more harmful substances. Introducing controlled fires that generally are not as hot could help reduce emissions. The current increase in extreme fires in some regions is part of a global ecosystem shift driven by human-caused global warming, Denning said. He warned that societies need to adopt strong policies to prevent huge regions of carbon-storing forests from being replaced by lower-carbon grasslands and shrubs. Based on the best estimates of CO2 emissions from wildfires, Denning said they are dwarfed by emissions from the burning of coal, oil, and gas, and that’s where the focus should be on reducing emissions. “Without very strong climate policy, industrial emissions are likely to triple in this century. Against that backdrop, the climate effects of increased wildfires are smaller than the error bars in the climate effects of all that coal, oil, and gas,” he said. Water vapor and smoke rise from the chimneys and cooling towers of the Laziska coal-fired power station, as a snowman melts on a hill in the foreground in Laziska Gorne near Katowice, Poland, on December 12, 2018. Dear readers, take a deep breath, and keep reading. We must be aware of the reality of this crisis, if we are to behave accordingly. His findings come on the heels of other disturbing studies that have revealed crashing insect populations in other places around the world. Lister has warned of an “ecological Armageddon” from these crashes. Meanwhile, increasing temperatures alone are already threatening to decimate US crop yields. Farmer’s livelihoods are at risk as warmer temperatures, drought and floods combine to disrupt agricultural productivity. In addition to farmers struggling to make a living, food prices will, of course, escalate. Another study showed that almost one-third of all of the bird species in Wales are now “declining significantly,” with some already having disappeared entirely. A recent report about the state of the Arctic showed that the number of Arctic reindeer has crashed by 58 percent in the last two decades alone, largely due to climate change. Two scientists warned recently that the planet’s extinction toll may be far worse than previously understood. Climate change, overpopulation of humans, exploitation of resources and habitat destruction are combining to cause cascades of extinctions. The scientists warned that today’s rates, which are already 1,000 times the normal background extinction rate, could be a staggering 10 times worse. In the US, another wave of US citizens have become climate change refugees. 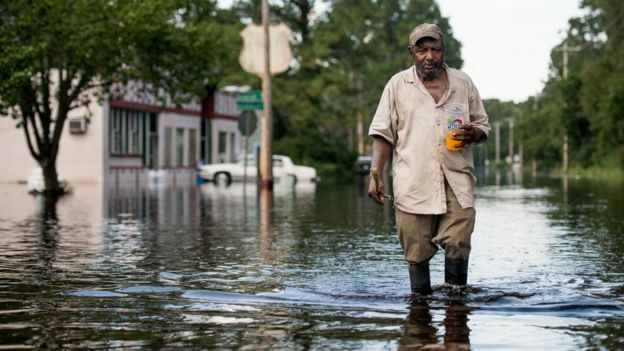 In the wake of Hurricane Florence in North Carolina last fall, many people of the New Bern community in the eastern part of the state have had their homes and lives destroyed. Already a largely old, poor and disabled community, these people cannot afford to stay where they are, and those who try to stay are beset with the psychological tolls and environmental toxins that are ravaging the area. In addition to the aforementioned dramatic news of the melting ice sheets and glaciers of Greenland and Antarctica, another study has revealed that glaciers in the Arctic are melting so dramatically they are pouring 14,000 tons of water every second into the ocean. This means they are contributing more to sea level rise than even current melting in Antarctica, and that the Arctic region has thus contributed nearly one full inch to sea levels since just 1971. The National Oceanic and Atmospheric Administration’s 2018 Arctic Report Card survey showed that sea ice had reached its second-lowest extent ever recorded as the Arctic experienced its second-warmest year on record. The report warns that this leaves the wildlife and communities across that region under great pressure as climate and ecosystems are undergoing dramatic changes. Meanwhile, the melting of ice around the world continues apace. In the Himalayas, a photo essay by the Nepali Times shows and describes the dramatic changes there, where the world’s highest glaciers are melting and receding at a shocking pace. In Canada, a recent report warned that a stunning 80 percent of mountain glaciers in Alberta, British Columbia, and the Yukon will disappear within just 50 years from now. Meanwhile, in the realm of the privileged, Miami’s affluent, many of whom are referring to themselves as “climate refugees,” are also abandoning their high-dollar oceanfront residences and moving to higher ground because of impending sea level rise. This is causing gentrification and suffering of the less privileged who happen to already be living in the areas where the rich are moving and driving up the costs of living for everyone. Last November, the extremely well researched and comprehensive National Climate Assessment warned that, among many other things, increasingly warmer temperatures across the US threaten national water security. The report warned of physical alterations in the nation’s water supplies, including rising seas driving saltwater further inland underground, which threatens major water sources for cities such as Miami. Mountainous regions are seeing more precipitation falling as rain rather than snow, endangering water supplies that rely heavily on snowpack. Meanwhile, in lakes, rivers and estuaries, warmer temperatures mean an increase in algal blooms like those which occurred in Florida last summer and fall, causing massive fish kills and disruption to life and tourism. Before the heat wave that is now scorching Australia, flash flooding in Sydney caused chaos and two deaths when the heaviest November rainfall in decades struck the city. Also on the sea level rise front, Venice made the news again recently with a tax on day tourists in hopes of raising money to address the crisis, while local residents and businesses deal with the chaos of a city struggling to survive against sea rise and constant flooding. On the other end of the water spectrum, a recent study showed that “anthropogenic climate forcing has doubled the joint probability of years that are both warm and dry in the same location” since 1931, posing a very serious threat to agriculture on a planetary scale. The study also found that the frequency of simultaneous hot/dry conditions will keep increasing, and will reach about 20 percent over the next 30 years without dramatic reductions of fossil fuel emissions. Farmers in the US Midwest are already sounding the alarm about the “radical” changes they describe as far as the dramatic impacts of drought and higher temperatures on their farms. They are already spending more money and time than ever in trying to figure out how to grow crops amidst ever-changing harsher conditions. Worryingly, several studies already exist that show the dramatic decline in nutrients of food due primarily to increasingly warm temperatures, some by as much as up to 30 percent. Meanwhile, the oceans continue to warm apace. Off the coast of Northwestern Alaska, the cod population is now at the lowest level it has ever been, and state officials have declared disasters after multiple salmon fisheries have failed. Meanwhile, further to the north, salmon runs are dramatically increasing due to warmer temperatures, reflecting the disruptive, chaotic and unpredictable nature of our warming planet. On that note, oceans are continuing to heat far faster than previously expected, and 2018 set yet another heat record for the warming oceans, a trend which further threatens marine life. The Guardian recently reported how several studies have shown how the US is woefully prepared for extreme weather events to come, including the dramatic increase of wildfires that have been predicted as climate disruption continues to advance. Last year, the wildfires in Californiaalone destroyed thousands of structures and left 85 people dead. Meanwhile, in January, wildfires scorched many parts of Australia, as large swaths of that country continued to bake under record-breaking high temperatures. Temperature records around the world continue to soar, as do projections. In the UK, a recent report by the Met Office warned that summers there could be more than 5 degrees Celsius (5°C) warmer by 2070. Very disturbing news came from a Japanese satellite that has spotted signs of methane gas bubbling up from beneath lakes that are forming in the tundra as Arctic permafrost continues to thaw. It is important to remember that methane is a far, far more potent greenhouse gas than CO2. Another troubling bit of news on this topic came in the form of a studyindicating that the upper reaches of the Himalayas, the highest mountain range on Earth, are already likely to be warmer than previously understood. The Trump administration’s climate change denialism has, as usual, been off the charts since the last dispatch. Their response to the National Climate Assessment, an intensely comprehensive study detailing the impacts of climate change across the US, including impacts that will cost the US hundreds of billions, if not trillions of dollars of damage in the coming decades, was to dismiss the findings of the federal report. Then, in the wake of that move and unable to bury its own National Climate Assessment, since it was a government generated report, the Trump administration and its denialist colleagues launched a full-scale assault against the science in the report. After releasing the report on Black Friday afternoon in an attempt to bury it, Trump simply said of the catastrophic findings, “I don’t believe it.” Following that, EPA Acting Administrator Andrew Wheeler and then-head of the Department of Interior Ryan Zinke, carried forward the assault on the report, along with other climate change denialists, calling the report“alarmist” and extreme. Furthermore, Wheeler went on to say that the Trump administration may even intervene in the next climate study. Meanwhile, back in reality, a poll released in late November showed that nearly two-thirds of Republicans and the majority of all Americans acknowledge that climate change is real. I understand that reporting this is akin to congratulating people for acknowledging the reality of gravity, but it has, indeed, come to this in the United States. Another poll also showed that seven in 10 Americans believe climate change is happening, a 10-point increase over four years ago. This is good, as the impacts of climate change are only going to intensify, and then some, given the International Energy Agency’s recent announcement that carbon dioxide emissions from the world’s richer countries were set to increase through the end of 2018, a trend that broke a five-year decline. 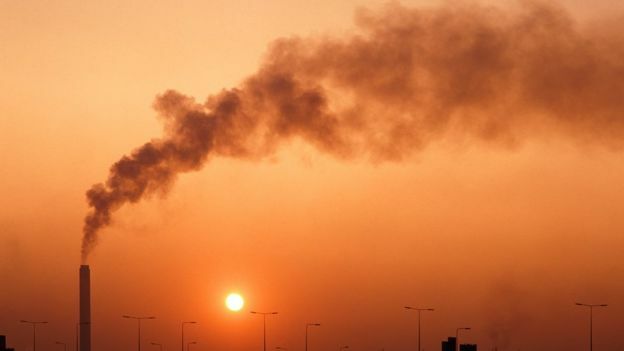 More bad news came from another report in early December 2018 which showed that global carbon emissions, not just in richer countries, were on track to jump to an all-time high through 2018, increasing by 2.7 percent. Meanwhile, at the time of this writing, atmospheric CO2 had already set three daily records for January, with an all-time high of 413.86 parts per million (ppm) on January 22. The year 2018 saw three daily records set for the entire year, 2017 and 2016 saw two daily records each, and 2015 saw one. Writing these climate dispatches has become increasingly difficult over the last five years. Each new report of the melting of glaciers and ice fields that is accelerating yet again, each new source of methane that is now speeding the warming of the already overburdened atmosphere, each new bird species listed as “declining significantly,” each new atmospheric CO2 level reached, and every round of temperature records across the planet leads to yet more grief, anguish, rage, anxiety, sadness — and finally, acceptance. Yet, doing this research and collating it into this report each month is akin to watching, very closely, the slow-motion death of someone I love dearly. At the same time, this work has brought some of the most magnificent people I’ve ever known into my life. Hence, the tragic drama of this Great New Era of Loss we have entered with Earth would not be complete without, of course, love. One of these people in my life is author, teacher, healer and elder of Cherokee descent, Stan Rushworth. His writing and wisdom touched me so deeply at the exact moment in my life when I needed it more than I even knew. His presence in my life enabled me to conclude my recently published book properly. Stan and I talk pretty regularly. He wrote me shortly after finishing my book, before it was published, as I had asked for his feedback. i read the other day that elephants are now being born without developing tusks, in areas where poachers have been killing them for the ivory. years ago in northern california, i heard a story about a place where lots of rattlesnakes lived, and the people there went on a series of extermination hunts, killing all they could find. the next generation of rattlers there carried no rattles, a quick adaptation to madness made by nature, by snake. it makes me wonder if earth has something in mind for her survival, or if human aberration has the power to change even nature’s mind. so many creatures and beings are now dying needlessly, that i wonder what’s going through her. i looked at big seas rolling in today, a storm coming, and though the surface was smooth and glassy, the waves huge, the roar was strong and carried far inland. i can open the door and listen from here. why so many people have chosen to forget so much is completely beyond me. Stan reminds me to see the beauty and the mystery, even in the loss. And in so doing, to also remember to go touch the Earth, in homage and respect, while so much continues to live today. It is clear that runaway climate disruption is upon us, and I wonder if humans’ ability to adapt to this increasingly harsh new world will be as dramatic as that of the elephants and the rattlesnakes when faced with their annihilation. President Donald Trump removed any reference to climate change from the White House’s National Security Strategy report in 2017. This year saw a number of notable wildfires, storms, and droughts ravage many regions around the world. As the year draws to an end and we look to 2019 for some relief, the National Climate Assessment, released in November and prepared across 13 federal agencies, isn’t reassuring: More frequent and intense events are on the horizon as the climate continues to warm. The report warns of further loss of life, substantial economic impact, and a transformation of current ecosystems so significant that “future generations can expect to experience and interact with the natural environment in ways that are different from today.” These photos illustrate this year’s most devastating natural disasters. Drought, kindling-like dry vegetation, and strong winds intensified wildfires this year to catastrophic levels, helping them burn hotter and spread faster. As global temperatures continue to rise for the foreseeable future and communities continue to be built and expand into fire-prone areas, wildfires will persist as a menacing force with devastating consequences. In Greece, a series of wildfires called the Attica fires spread across resort communities such as Mati, and began on July 23 during a particularly lengthy heat wave in Europe. These fires were the second-deadliest series in the 21st century with over 90 dead. Although many factors contributed to the high death toll, the prolonged hot and dry conditions coupled with winds in excess of 45 mph fed and fanned the fast-moving blaze. California also had a particularly disastrous year that included both the most destructive (Camp fire) and the largest complex fires (Mendocino Complex fire) on record for the state. The Mendocino Complex fire torched over 400,000 acres of land in July and killed a firefighter. The Camp fire, which was first reported on Nov. 8, in Paradise, California, claimed the lives of 88 people and destroyed more than 250,000 acres. Other notable fires in California were the Woolsey fire, which began in November and burned all the way from Thousand Oaks to the coastline in Malibu, and the Carr fire in July, which claimed the lives of both firefighters and civilians. A burned neighborhood in Paradise, California, as a result of the Camp fire, Nov. 15. A home is overshadowed by towering smoke plumes as the Camp fire burns through Paradise on Nov. 8. People watch a wildfire in the town of Rafina, near Athens, July 23. A scorched area following a wildfire in the Greek village of Mati, July 26. Firefighters monitor a backfire while battling the Ranch fire in Northern California, Aug. 7. Burned-out cars from the Ranch fire, part of the Mendocino Complex fire, which hit Spring Valley in Northern California, on Aug. 7. Tim Biglow tries to save furniture from the Woolsey fire in Malibu, Nov. 9. The Woolsey fire reaches the ocean along the Pacific Coast Highway near Malibu, Nov. 9. Homes destroyed by the Carr fire, Redding, California, July 27. The overall rise and often extreme temperatures, coupled with little to no precipitation, led to lengthy heat waves in regions worldwide and put some cities in a drought. The Australian state of New South Wales was plunged into total despair “with close to 100% of the state in one of the three drought categories,” according to the Department of Primary Industries, which monitors drought. The state’s second-driest fall on record was followed by a very dry winter, leading to large-scale crop failure and dried-up dams. Grim images of skin-and-bones livestock began to emerge as farmers struggled to feed their animals and find them adequate water. Northern and Southern European countries alike were gripped by a deadly heat wave caused in part by a stalled jet stream beginning in May. The prolonged extreme temperatures caused a widespread browning of fields and vegetation, which could be seen from space. Other effects included a number of wildfires, the melting of the southern peak of Kebnekaise in Sweden, causing it to lose its title as the highest peak in the country, and a critical reduction of the Rhine’s river levels, resulting in the death of thousands of fish. In Afghanistan, another very dry winter has led to the worst drought in decades with millions of people in some parts of the country lacking access to food and water. The situation is so dire it rivals the ongoing conflict between the government and the Taliban. The United Nations announced the allocation of $34.5 million in emergency aid in October. The riverbed of the Rhine dried out on Aug. 8 in Düsseldorf, Germany. Dry sunflower plants in a field near Lyon, France, affected by drought during a heat wave on Aug. 20. Harry Taylor, 6, plays on the dust bowl his family farm has become during the drought on June 17 in Coonabarabran, New South Wales, Australia. A train makes its way through dry paddocks in the drought-hit area of Quirindi in New South Wales, Australia. An Afghan girl carries empty containers to collect water as a younger child looks on in Sakhi village, Afghanistan, on July 19. Drought-displaced Afghan children at their tent at a camp for internally displaced people in the Injil district of Herat province in Afghanistan on Aug. 3. Hurricanes, or typhoons, as they’re called for storms over the western Pacific ocean, are fueled first and foremost by warm ocean waters. As the oceans gradually heat by around 0.2 degrees per decade, we should experience larger and more frequent storms during future hurricane seasons. Two major storms to hit the United States this year were hurricanes Florence and Michael. Both storms reached a Category 4 while over the warm ocean waters, and each caused destruction in their own way. Florence, the first major hurricane of the season, weakened before making landfall as a Category 1 on Sept. 15, but moved so slowly and dumped a devastating amount of rain (20 to 30 inches) that it caused catastrophic flooding in North Carolina and 53 deaths. Hurricane Michael, the third most intense hurricane to make landfall in the US, hit Mexico Beach, Florida, as a Category 4 on Oct. 4. Its wind speeds (up to 155 mph) caused more damage than its rainfall. At least 36 people died as a result of Michael. Super Typhoon Mangkhut was a Category 5 as it made landfall in the northern Philippines and made its way toward South China. In anticipation of this incredibly strong storm, the Hong Kong Observatory labeled it a Signal 10 (the strongest in its range). The typhoon caused an incredible amount of damage with heavy rain, strong storm surge, wind damage with speeds of 109 mph and deadly landslides, and caused at least 88 deaths. Jovani Quintano and Carlos Gomez walk through a flooded neighborhood after heavy rains brought on by Hurricane Florence, Sept. 19, in Lumberton, North Carolina. Floodwaters from the cresting Little River inundated the area of Spring Lake, North Carolina, during Hurricane Florence, Sept. 17. Hurricane Florence churns through the Atlantic Ocean toward the East Coast on Sept. 12. The aftermath of Typhoon Mangkhut in Hong Kong on Sept. 17. Rescuers dig at a landslide site where dozens of residents are believed to have been buried during heavy rains at the height of Typhoon Mangkhut in Itogon, Benguet province, the Philippines, on Sept. 18. Rescue workers make their way through floodwaters during a rescue operation after Super Typhoon Mangkhut passed through Macau on Sept. 16. Route 98 in Mexico Beach, Florida, was decimated after Hurricane Michael passed through the area in October. Amanda Logsdon begins the process of trying to clean up her home after its roof was blown off by Hurricane Michael on Oct. 11 in Panama City. A man walks through Mexico Beach, Florida, Oct. 16. 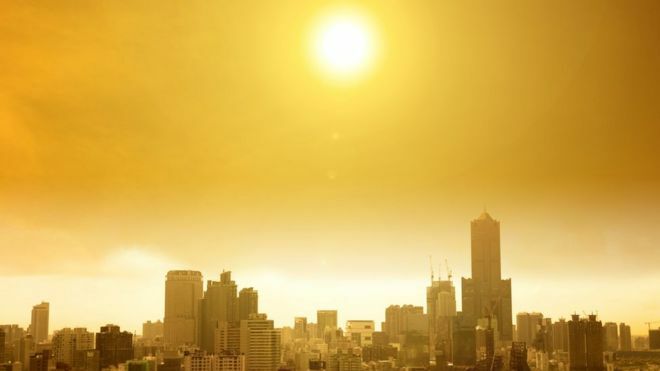 Climate scientists warn that 2019 may be the warmest year on record largely as the result of a possible El Niño event exacerbated by man-made global warming. There is a 90 percent chance that El Niño will form and continue through the Northern Hemisphere winter of 2018-19 and a 60 percent chance that it will continue into the spring of 2019, according to the Climate Prediction Center at the National Oceanic and Atmospheric Administration (NOAA). The opposite of El Niño, La Niña, is when sea-surface temperatures in the central Pacific drop to lower-than-normal levels. These warm and cool phases are part of a recurring climate pattern that occurs across this section of the Pacific, known as the El Nino-Southern Oscillation (ENSO), according to the National Oceanic and Atmospheric Administration (NOAA). The strong El Niño of late 2015 to early 2016 helped boost global temperatures to their warmest on record in 2016, according to AccuWeather Senior Meteorologist Brett Anderson. “However, if there was no El Niño during that period, I still suspect that 2016 would have still ranked as the second warmest year on record globally due to the steady increase in greenhouse gases into the atmosphere, which trap heat closer to the surface,” Anderson said. So far, 2018 is on pace to likely be the third warmest year on record, behind 2016 and 2017. “What’s interesting is that 2018 started out under La Niña conditions, which usually has a cooling influence on global temperatures, but it was not nearly enough to cancel out the warming from the release of man-made greenhouse gases,” Anderson said. However, since late April 2018, sea-surface temperatures across much of the east-central tropical Pacific returned to neutral levels following the La Niña of 2017-18, meaning neither La Niña or El Niño present. Weather vs. climate: What’s the difference between the two terms? “Looking back at the data, years with moderate to strong El Niño’s continue to trend warmer. If this upcoming El Niño reaches at least moderate strength and persists at least 9 months, then I think that 2019 can end up in the top two warmest on record globally,” Anderson said. The global temperature impacts of El Niño are sometimes delayed. Therefore, 2020 may end up warmer than 2019 even though this upcoming El Niño may be well over by that time. Global ocean water temperatures in October 2018 ranked as the second warmest on record for October. Oceans can store a lot of heat, thus the world’s oceans may remain near or at record warmth through 2019, which will further add to the warming influence of the global air temperature. It is certainly possible that 2019 may be the warmest year on record, Anderson said. The impacts of El Niño have been more severe in recent years due to global warming, and these impacts may be worse as temperatures continue to rise, according to a recent study in the journal Geophysical Research Letters, published on Aug. 22. Emerging research suggests that the typical atmospheric responses to La Niña and El Niño are changing and that the expected weather in the United States may not follow the traditional ENSO pattern. The AccuWeather Long-Range Team closely follows the on-going research linking climate change to the long-term trends in ENSO patterns, according to AccuWeather Long-Range Meteorologist Max Vido. “When creating our seasonal forecasts for the U.S., we take into account the long-term climate trends when predicting temperature and precipitation anomalies compared to the 30-year normal (1981-2010),” Vido said. The team has become increasingly vigilant of how the global weather pattern during more recent El Niño and La Niña events can differ from the traditional expected patterns. “So, instead of assuming a certain ENSO phase will lead to a particular seasonal weather pattern to areas of the U.S., we acknowledge how the once traditional impacts could be different. This is all factored into our seasonal forecasts,” Vido said. As of November 2018, El Niño has not officially begun and questions remain about the strength and longevity of this El Niño. The years 2014, 2015 2016 and 2017 all rank in the top four warmest years on record globally, ocean and land combined, with data going back to 1880, according to the National Aeronautics and Space Administration (NASA). “It’s not hard to see that with the potential added boost from another El Niño that 2019, or even 2020, is a pretty good bet to take out some of those years from the top four list,” Anderson said. Seventeen of the 18 warmest years in the 136-year record all have occurred since 2001, with the exception of 1998, which was a strong El Niño year, according to Anderson. Research shows that the warming climate will have a profound affect on extreme weather events, such as heat waves, wildfires, droughts, flooding and violent storms. The U.S. government released a report in November 2018 that highlights these impacts. The report examines the effects that climate change will have on health, local communities, the economy and infrastructure.